The original ANDERIC RRUR01.2 for Roku with Learning and Backlit Keys Remote Control is in-stock and ships within 24 hours. 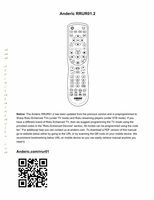 The original ANDERIC RRUR01.2 for Roku with Learning and Backlit Keys Remote Control carries a 1-Year Warranty. Whats New with Version 2? The Anderic RRUR01.2 is pre-programmed to work all Roku 1, 2, 3, & 4 (entire list below) streaming players. The RRUR01.2 is a 4-device universal and can be programmed to your Roku, TV (including CRT, HDTV, Flat-panel TV, Roku TVs), and soundbar (or other audio equipment), as well as Set-top-boxes (Cable, Sat, DTA). It is already pre-programmed to your Roku Box and Roku Enhanced Insignia TVs. 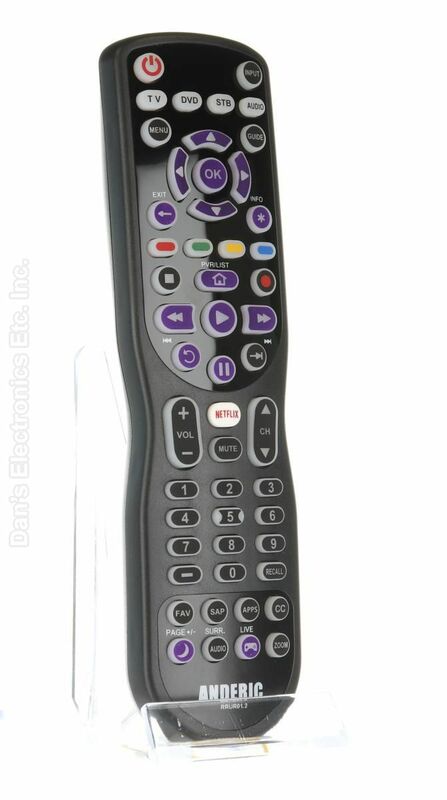 This remote will also support all Roku smart TVs (TCL, Hisense, Insignia, LG, Element, and Sharp but require a 1-time programming). NOTE: CHANNEL KEYS (number pad and CH+/-) WILL NOT WORK BECAUSE TV DOES NOT SUPPORT THEM. Works with Roku enhanced TVs. Works via infrared signal (non-RF), line-of-site is required. Has LEARNING ability. This allows for transferring codes from your original remote. Comes with a screw for the battery cover. Use is optional. Note: When operating, the RRUR01 requires direct line-of-site with your Roku box. by Kendrick on February 13, 2018.
by Ryan on April 08, 2019. Just what I needed. Works perfect. Fasst set up no issues. by gerard on January 03, 2019. I am satisfied with the remote would buy again. by Carl on July 27, 2018.
by greg on July 15, 2018. The remote works well for our set up and I am well pleased. The first remote was damaged by the post office in shipping and a replacement was very promptly shipped out. The second remote came without damage and has been working very well. Thank you for your service. by jim on July 14, 2018.
by Billy on June 29, 2018.
by jennifer on February 16, 2018.
by Hank on January 23, 2018.